Patients who have undergone the surgical repair of Tetralogy of Fallot are prone to developing arrhythmias later in life, with more than a third of adult patients experiencing atrial arrhythmias. This is especially true for patients who received treatment many years ago. While it is general practice today for the repair operation to be performed quite early in life (often during the first year), it was formerly common to defer the procedure until later in childhood. It has been observed that the older a patient was at the time of the operation, the more likely he or she will be to develop arrhythmias. Arrhythmias often occur because of the thickening or scarring (fibrosis) of tissue in the right ventricle, the patch repair of the ventricular septal defect, and/or the cutting into and subsequent scarring of ventricular tissue. All of these may slow the conduction of electrical impulses through the heart tissue. Other contributing factors may include the gradual enlargement (dilatation) of the right ventricle. While not occurring with great frequency, dysfunction of the heart's natural pacemaker, the sinoatrial node, is a well-recognized problem in repaired Tetralogy of Fallot. Patients can benefit from pacemakers for this condition. Treatment of arrhythmias in these patients may involve medications (e.g. amiodarone), though other approaches are preferred where possible. Pacemakers or ICDs may be implanted. ICDs (implantable cardioverter defibrillators) detect arrhythmias and shock the heart in order to restore normal rhythm, thus protecting against sudden death and acting as temporary pacemakers. Radiofrequency ablations (non-surgical procedures in which the heart tissue that is causing the arrhythmia is neutralized) are performed, often with much success. 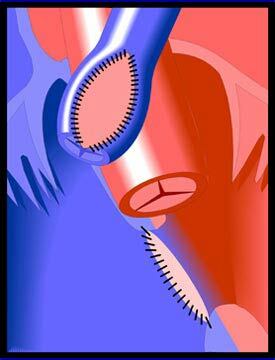 Reoperations are sometimes necessary, usually involving the replacement of the pulmonary and/or tricuspid valve.